When interviewed by The Cardboard Herald and W. Eric Martin back in January one of the first questions they both asked was why I'm doing what I'm doing. Why hand-craft games rather than submit them to publishers? Why fund it myself rather than go the Kickstarter route? Both good and valid questions, and despite the fact that I know why I'm doing it, I flailed around a bit for an answer when on the record. As a result I've spent some time thinking about why I'm doing this. Why I'm risking my own money and investing a decent chunk of my time into the project. It's not to start a company that will become a full-time concern for me - I've tried that and failed spectacularly once already, and while Jamey Stegmaier has the skills, I don't - I accept that. So, in a very buzzword bingo, corporate-speak-esque fashion (I am a manager in a large corporation in my day job after all), I've decided to codify my mission, values and strategy. While that seems frankly ridiculous in a company with only one person (me), I figure the time spent thinking about it is probably time well spent, and if I can codify them I've them got something written down that I can refer to and check that I'm still heading in the right direction. I can also use them as a yardstick: Has my behaviour lived up to my aspirations? By publicising them here I'm committing to them, and you guys can hold me accountable too! FlickFleet is coming along nicely so one of the many things I'm working on at the moment is pricing and sizing the print run. 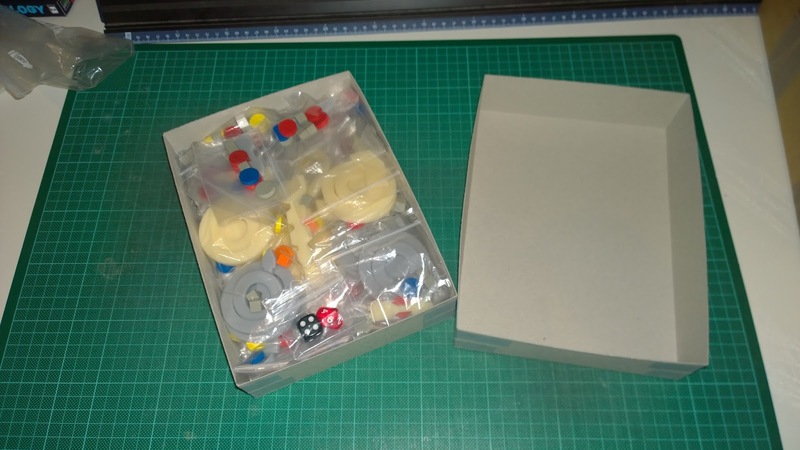 As with Zombology, I'm intending to do a small, limited edition run first where I make the boxes by hand and cut out the ship dashboards by hand (though I'll be buying in the wooden pieces and laser cutting the acrylic ships). So how big a print run should I do? In a perfect world I'd like to do a print run that I can comfortably hand-craft and sell through within a year. The smaller the print run, the more confident I am of both those things. At the same time, the bigger the print run, the better the economies of scale, so the cheaper each copy is to make and the cheaper I can price them (which will hopefully make them easier to sell). Although, of course the initial outlay is higher. The other thing to consider is the number of pre-orders. For a professional run or a Kickstarter, the more of these the better. For a small hand-made run it's not that simple. Since it takes me time (at this point I'm estimating 1-1.5 hours) to make each copy, and I'm doing this in my evenings after the kids go to bed, I actually don't want too many - it'll just put me under a lot of pressure to get them done and delay building up stock and promoting the game. For Zombology I had 20 pre-orders (on top of the 30 copy run I'd already sold out of to friends and family), which was 10% of the print run and about 15 hours of crafting to make. The Baby was only 3 months old at that point, so our sleep was dreadful (it's still pretty bad! ), so that was a lot of evenings and took about a month to complete. Ideally I'd have about 20-25% of the print run spoken for up front, which will still mean a chunk of evenings and probably a calendar month of construction. The biggest factor for FlickFleet's cost though is the laser cutting, for which there isn't much in the way of economies of scale (you're paying for cutting time which scales linearly with number of copies). One of the options I'm exploring is buying a laser cutter. They are very expensive, but it would save me a lot of cost per game and I would be able to amortize it over the games (and potentially other projects). At the moment it looks like I could do it for £30 if I do the laser cutting myself and £40 if I outsource the laser cutting. That £10 is a big deal, £40 is a lot to ask for for a hand-made game. use to make the decision on run size, and they are coming in surprisingly quickly at the moment, considering the fact I've not announced it or even worked out the price! Hopefully I'll be ready to decide and make an announcement shortly - keep your eyes peeled! I noticed in passing Jamey Stegmaier's 2017 Stonemaier Games Stakeholder Report on twitter this week. It's an incredible read. Especially when you compare it to his inspiration, the Steve Jackson Games equivalent. And my earlier admission of failure. What made it especially interesting to me was comparing it with my first attempt at running a publisher, Reiver Games, and my current self-publishing project Eurydice Games. Jamey has been fantastically successful. Fantastically. Fair play to him, he's exceptionally good at what he does. Stonemaier have one full-time employee (Jamey) and made $7.1 million in 2017. That's more than double what they made in 2016. Plus, importantly they were profitable. Their first game (Viticulture) was published just four years earlier. $0 - $7.1 million in turnover in four years. Now that's impressive. For comparison, Reiver Games ran for 5 years, its best turnover was around £22,000 and I never took a salary from it. Clearly Jamey does this way, way better than me. Reiver Games was founded in 2006 and was just hand-crafted runs until mid-2008. I made the jump to 'professional' publisher then, just before the stock market crash in September 2008 when lots of people's spare cash dried up. I invested a small amount of my own money in it at the beginning, then a fairly large amount of my life insurance payout and then took out a loan. Servicing that loan killed Reiver Games. Stonemaier by comparison have no debt. Now probably the biggest difference between us is Kickstarter. Kickstarter was founded in 2009 and Jamey has initially released most of his games through it, with great success. Pretty much everyone who is new to publishing (and quite a few old hands) now launch new games through Kickstarter, but it wasn't available in the UK until after Reiver Games had shut down and I'm still uncomfortable with it now. Which probably explains why I'm hand-crafting small print runs again and Jamey is turning over millions of dollars. In addition to the fantastic success Jamey has deservedly raked in, there's several things in that report that staggered me. Jamey has been that successful making one new game a year, plus a couple of expansions. When I was running Reiver Games I was convinced the only way to be successful was to have a lot of games on your books like Z-Man or Rio Grande. That was always my aim: get to the point where I had several games coming out a year. Hopefully one of them would be a smash hit, but if not, half a dozen less successful games meant that you could more easily sell to distributors and shops and meant that brand awareness would build as people saw your logo in more and more places. But even in these days, when there are thousands of new games appearing on Kickstarter, Jamey has been hugely successful with one new game a year. That goes to show the quality of the games he's producing, and the fan-base he's built. The print runs show just how successful he's been. At the time of Reiver Games people talked about 5,000-10,000 copy runs being for very good games, with maybe up to 50-70,000 if the game won Spiel des Jahres or something similar. My 'professional' Reiver Games print runs were 3,000, 2,000 and then 3,000 (for It's Alive!, Carpe Astra and Sumeria respectively). Nowadays I'm hoping that I can find 200 people interested in Zombology (which admittedly is a niche, within a niche, within a niche!). Stonemaier have five games in circulation with between 31,000 and 150,000 copies in the wild. Those are epic print runs, and with such large runs come some huge economies of scale - something I never successfully achieved. Even with those however, Jamey admits that his margins aren't where he wants them. He's aiming for manufacturing costs to be 14-20% of retail. He's not quite there yet. During my Reiver Games days I was aiming for 20%, but only managed it once. It was nearly 30% for It's Alive!, about 25% for Carpe Astra and finally 20% for Sumeria, for which I did a larger run (so some economies of scale) and bumped up the price to £25. Sadly, with my obsession for small boxes all that meant was my game was the only £25 game on the small box shelf, the rest were all £18-22. Looking really expensive by comparison didn't help me since the vast majority of my sales were through shops and distributors. Now that I'm making games by hand and selling directly I don't need to worry about shops and distributors getting their cuts, so I'm aiming for 50% (it's just under 40% for Zombology and due to the laser cutting and perspex it'll probably be over 60% for FlickFleet :-( ). The other thing that stood out was the size of Jamey's audience. He's got 33,000 people on his mailing list (I've started from scratch again, so I've only got 60! ), 9,000 twitter followers (to my 2,250) and is active on Facebook, Instagram and YouTube where I don't even have accounts. He's clearly doing a lot of things right. For those of you coming here for advice on getting into game (self-)publishing, you should be going to Jamey. Come here for the cautionary tale instead! It's been a very busy week this week. I've shipped the first two blind playtesting copies of FlickFleet, made my first batch of Zombology in ages (I've been focussing on FlickFleet for the last couple of months), had a UK Games Expo seminar accepted and then spent the weekend with Paul (my FlickFleet co-designer) doing some gaming, some playtesting and attending Beyond Monopoly, the club in York, for the first time in probably nine years. Finally, I found out that FlickFleet is not a finalist in the Cardboard Edison Award - despite really positive feedback from the judges. The blind playtesting is a crucial step in the development of a game. You're sending a copy of the game, complete with rulebook to strangers for their feedback. They will have to learn the game from the rulebook, as if they'd bought it in a shop and then play it - rightly or wrongly based on their reading of your rulebook. You will then get feedback on the quality of the rulebook, what wasn't clear or was missing and their opinions of the game. From strangers. Who unlike the people you will have mostly been testing with, are not your friends and are less inclined to go easy on you to protect your feelings. It's an invaluable opportunity to find the weak spots in your rulebook (writing rules well is very hard, and invariably you will have missing things or made statements that can be interpreted in different ways), and to get a better idea how a random punter would experience and feel about your game - it's also a great opportunity to get a better idea of what the market reception of your game might be. Zombology has suffered a bit over the last couple of months. I'd built up a decent stock in December, and while I intended to keep cranking out copies in January and February, sales were not fast enough to demand it (though on track!) and I spent what little time I had (The Baby has been sleeping terribly since Christmas, so I've been going to bed early and Eurydice time is between kids' bedtime and mine, a time period that has been heavily squeezed!) on FlickFleet instead. In January I was trying to get a Cardboard Edison Award submission done (more on that later) and then this month it's been upgrading my copy, getting a copy to Paul and then working on the blind playtesting copies. With a trip to Beyond Monopoly last weekend though I needed to boost my slowly diminishing stock a bit - I'd rather take far more than I need than have fewer than I could have sold. I got six boxes and three games made during the week, which meant I had 15 copies to take with me to Beyond Monopoly. On Monday I also heard that the seminar idea I had pitched to the UK Games Expo in Birmingham in June (me hand-crafting a copy of Zombology live in front of an audience while talking about my experiences running Reiver and Eurydice Games and the many tips and tricks I've picked up over 16 years of hand-crafting games). It's going to be 1-2pm on Sunday 3rd June and spaces are limited to 50 people, so if you're interested I'd get there early! Friday evening we braved the snow and drove down to York to see Paul and his family again. I was too tired in the evenings for our usual playtesting and gaming (baby-related sleep deprivation again! ), but Paul and I made it along to Beyond Monopoly on Saturday afternoon - the big games club in York I used to attend when I lived there. While there I spent the afternoon demoing Zombology and playtesting FlickFleet and I sold two copies of Zombology :-) It was also great to catch up with some old gaming buddies. There was a lot of interest in FlickFleet too - several people signed up to my mailing list to be kept in the loop. The week ended with the news that FlickFleet had not made the cut for the Cardboard Edison Awards finalists. From a field of 192 the judges had to pick approximately fifteen based on a video introduction, a rulebook and a brief overview. My video (done the night before submission) was spectacularly uninspiring - I sounded terribly dull and not at all excited about my game, and the rulebook was pretty poor too - it was also last minute, and had no examples and not enough diagrams. I could really have done with getting the new rulebook (finished last week) done in time for the submission at the end of January. 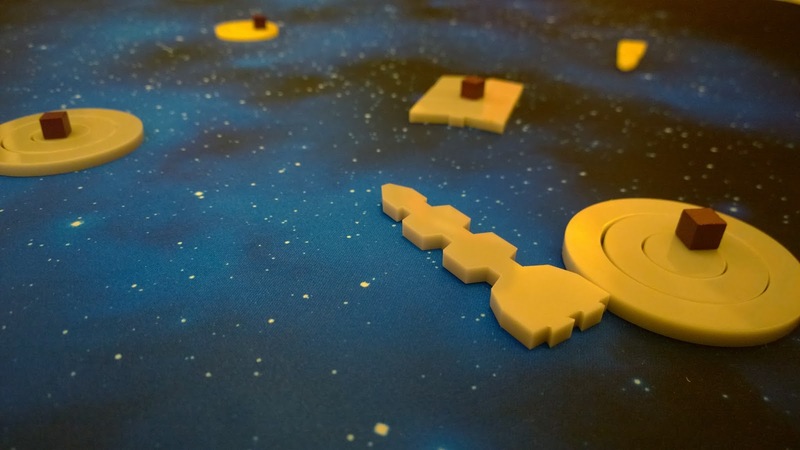 This week I'm hoping to make it to Newcastle Playtest on Tuesday to show off the latest FlickFleet changes and get peoples' opinions on them.